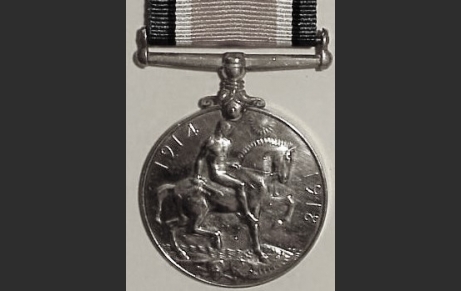 British War Medal. DLI Collection. From Ryhope, served with 18th Battalion DLI (Durham Pals), awarded Croix de Guerre. Born in 1883 in Ryhope, George Allison enlisted in the 18th (Durham Pals) Battalion DLI at Sunderland on 18 September 1914 and served in ‘C’ Company. As a Lance Sergeant, he was awarded the French Croix de Guerre in May 1917 for his bravery. He was demobilized in February 1919. Served as 18/426 Private, Corporal, Lance Sergeant 18th Battalion DLI.